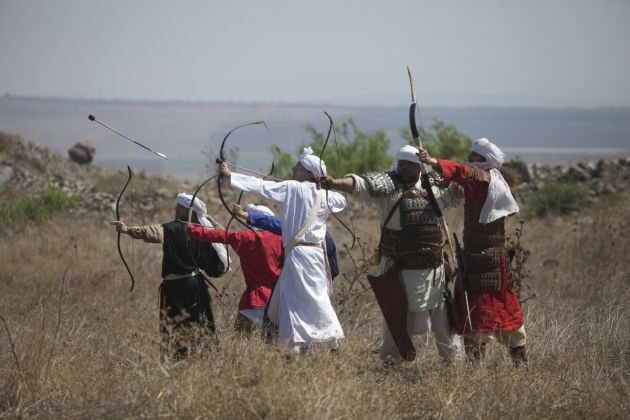 (Photo: REUTERS / Tomer Appelbaum)Israeli enthusiasts wearing costumes take part in a re-enactment of a decisive Crusaders battle in northern Israel's Galilee region July 5, 2014. About 50 people participated in the re-enactment of the Battle of the Horns of Hattin, where Muslim forces led by the legendary Salah al-Din defeated Christian fighters in the late 12th century. Picture taken July 5, 2014. To differentiate between Christians and Muslim Arabs in Israel, the government has recognized a separate Aramean identity among local Christians who identify with the ancient people. Interior Minister Gideon Saar on September 16 ordered Israel's Population, Immigration and Border Authority to recognize the majority of Israel's Christians as Arameans instead of Arabs, Israel Today reported. Saar was quoted as saying that Aramean was the actual ethnicity of most of the region's Christians before the conquest by Arab Muslim in the 7th century. Just over 75 percent of Israel's 7.8 million people are Jews, some 17 percent are Muslims and around 2 percent are Christians. In his order, Saar said local Aramean Christians have a discrete "historical heritage, religion, culture, descent and language," which are the requirements to be recognized as a national or ethnic group. "The existence of the Aramean nationality is clear and obvious," Israel Today quoted Saar as saying in his official directive on the country's population registry. The change in registry to Aramean will be made upon request by those Christians born into Christian clans and those who can speak Aramaic, said the official. According to the report, a big number of Christians who have already applied for such recognition since 2010 will now be granted their ethnic status of choice. Yariv Levin, a member of the Israeli parliament from the Likud faction, advocated a bill in February to identify Christians as a minority group separate from Arab, The Jerusalem Post reported. In pushing for the bill, Levin argued that this group deserved to be given their unique representation on the Advisory Committee for Equal Opportunity in Employment Commission. "I don't try to change the reality; the reality is there. There is a big difference between Christians and Muslims, and they deserve recognition and separate representation," Levin was quoted as saying. The spiritual leader of the Israeli Christian Recruitment Forum, Father Gabriel Naddaf, said Saar's decision rectified a "historic injustice." "[This decision] corrects a historic injustice that wrongly defined Israel's citizens of eastern-Christian descent as 'Christian Arabs,' although other than their spoken language, they have absolutely no connection to the Arab nationality," Israel Today quoted Naddaf from his Facebook post.